I had a weird relationship with chicken dishes growing up. I would love to say that I ate chicken and loved it, but I didn't. My mother was a great cook, but she favored beef, pork and seafood. She only made a few chicken dishes and most of the chicken that we ate was fried. I'm not taking about great homemade fried chicken, shaked in a brown paper bag, with delicious crispy skin. What I'm taking about is the fried chicken from the grocery store counter. It always had a slightly off flavor (I am sure they reused their oil) and my parents loved it. I couldn't stand it. When I met my husband I almost didn't marry him when he told me that he loved fried chicken. Yuck, I couldn't handle even looking at it, much less eating it. I have tried a lot of great fried chicken over the years and many people have tried to convert me, but I am sorry to say that I still can't stomach it. The grease does me in the same way that pancakes at a greasy spoon do, my stomach just says no thanks. Since I married a man that is big on any type of chicken and my two boys will eat chicken dishes before much of anything else I have learned to compromise. I make a lot of chicken dishes, just not fried. Every couple of months my family (without me) goes out and has fried chicken, they are happy and I am too. Tonight was a chicken night in my household. I love using marinades on chicken. It keeps the meat moist and adds flavor without being over powering. Tonight I tried a new recipe for Cilantro Lime Chicken from Redbook Magazine. This recipe has 9 ingredients. It takes 1 hour of total time, 10 minutes of which is active and makes 4 servings. I only made a few changes to the original recipe. First I used a yellow onion. I already had a bag and didn't see the need to buy another bag of white onions when I would only use one. For the honey I am lucky enough that my husband's cousin raises bees and gave us a jar of homemade honey. If you have never had homemade honey, it is so much better than the honey from the grocery store. Plus if you have allergies local honey is supposed to help you be more resistant to pollen issues. I found that I needed to flip my chicken approximately once every ten minutes, so four times total during the baking time. The chicken tended to start to burn and stick to the foil without this step (I had used canola spray and it still stuck from the honey). The flavor on this chicken was delicious. I would suggest a couple of changes. The skin didn't crisp as much as I would prefer. In order to change this I would either take off the skin (which would also save a significant amount of fat) or broil the chicken the last 5 minutes. This way the skin would have a crisp outside while maintaining the delicious cilantro-lime flavor. My kids loved this recipe and my youngest ate two legs all by himself (which is a ton for a 4 year old!). It is definitely kid friendly and a good way to introduce your kids to cilantro and jalapeño. For the recipe go to Cilantro Lime Chicken. 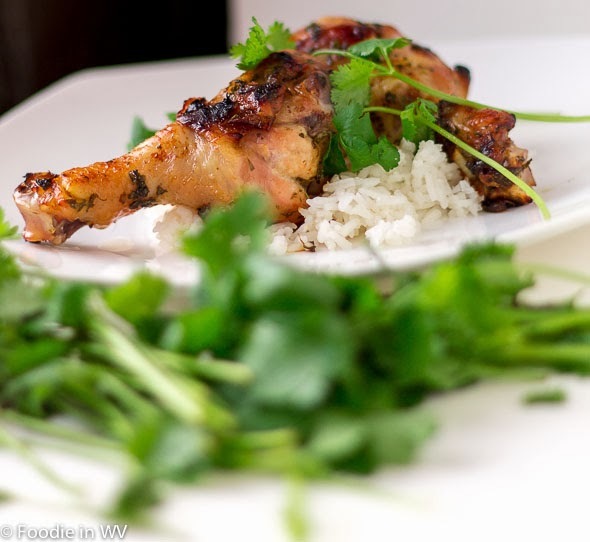 A simple roasted chicken recipe with a Cilantro Lime Marinade. Can be made more or less spicy by seeding or leaving the seeds in the jalapeño. It really was flavorful and best of all my kids loved it! This recipe sounds like it's something my family would LOVE! My family is big on chicken, too! Mine did :) My two boys ate as many pieces of chicken as I did, it was a hit! I'm not a huge fan of fried chicken myself but my hubby does. He actually makes it as well. I love cooking chicken though and seeing that your son downed 2 pieces I may have to give this one a try. My youngest son isn't a big fan of chicken and neither is Madison. Maybe this might change their mind. Chicken is one of the few things my kids will eat right now :) Since the jalapeño is seeded it's not spicy, making it very kid friendly. This recipe looks really good. I grew up the opposite of you, most of what we ate was chicken. Kind of made me a picky eater but I am branching out now. I still really like chicken and this looks really good! The cilantro and lime work really well together to give flavor to the chicken! This sounds really delicious. I didn't know much about cooking chicken until I was an adult because my dad hates chicken and my mom rarely cooked it when I was growing up. But I love it; it's cheap and so versatile. I think we had very similar upbringings :) I love it now as an adult too, it's a great, inexpensive protein source! My daughter loves chicken too. She wants to have chicken every meal. Whenever we eat out,she still orders fried chicken. I think she would love this new recipe. I love the flavors of lime and cilantro - great looking meal! Thanks :) They do work really well together I agree! Thanks :) The nice part was that it was really easy too!